Great Read: MacFarquahar on Krugman in the current New Yorker. Larissa MacFarquahar’s profile of Paul Krugman is worth your attention. It’s a substantial tome, full of good stuff, from a portrait of the economist as a young smart guy to the sequence of what I wouldn’t call radicalization, but his conversion to the assumption of a kind of moral duty to speak. But while the meat of the piece in many ways lies with this latter end of Krugman’s career, the bits where he tries to speak truth to power whilst educating the rest of us, the parts of the profile I like best are those that give insight into the practice and competences of economics as an aspiring science. As an aside, I can affirm the more general truth of this anecdote. I had the chance to sit in on some of the promotion and hiring reviews pending at MIT’s economics department (coincidentally, Krugman’s former intellectual home) and while there were certain appointments in which the mathematical sophistication and abstraction from recognizable real-world issues was beyond not only me, but just about everyone in the room too, there were others in which the key ideas were rigorous and meticulous demonstrations of pretty obvious ideas. Krugman began to realize that in the previous few decades economic knowledge that had not been translated into models had been effectively lost, because economists didn’t know what to do with it. His friend Craig Murphy, a political scientist at Wellesley, had a collection of antique maps of Africa, and he told Krugman that a similar thing had happened in cartography. Sixteenth-century maps of Africa were misleading in all kinds of ways, but they contained quite a bit of information about the continent’s interior—the River Niger, Timbuktu. Two centuries later, mapmaking had become much more accurate, but the interior of Africa had become a blank. As standards for what counted as a mappable fact rose, knowledge that didn’t meet those standards—secondhand travellers’ reports, guesses hazarded without compasses or sextants—was discarded and lost. Eventually, the higher standards paid off—by the nineteenth century the maps were filled in again—but for a while the sharpening of technique caused loss as well as gain. That is: economics as practiced in the academy is in possession, its practitioners believe (and I mostly do too, not that my opinion matters) of a body of methods and a growing number of results that suggest that it is a powerful way of analyzing certain kinds of human behavior, and for making useful predictions about some things. But it is far from as comprehensive in its explanatory power as some of its practitioners — and many more in the economic pundit class — would have one believe. …and that would be when economists — or political/ideological allies — present as settled conclusions that are either uncertain or false. Often (always?–ed.) in error … but never in doubt. 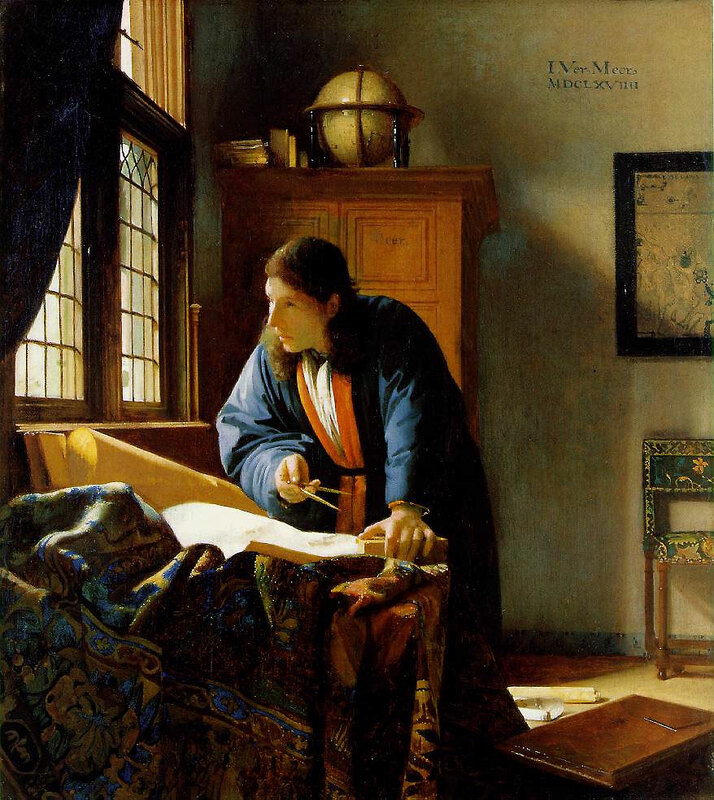 Image: Jan Vermeer, “The Geographer,” 1668-1669.